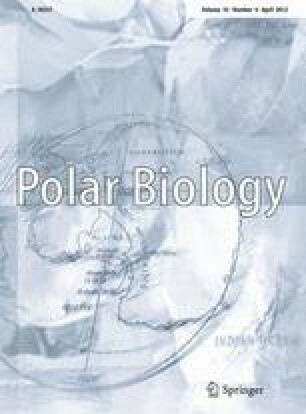 The aim of the current study was to identify maternity denning areas and to describe aspects of denning behaviour in polar bears (Ursus maritimus) in Svalbard, Norway. Den observations made during aerial and ground surveys (n = 553), observations of recently emerged family groups made during capture and tagging of bears (n = 206), and dens recorded by satellite telemetry (n = 76 dens) were used to describe the distribution of dens in the Barents Sea region. Data were collected during March, April, and May from 1972 to 2010, and while most dens were abandoned during the first 2 weeks of April, there was substantial variation. The highest number of dens was recorded on the islands in the eastern and northern parts of Svalbard with fewer dens found further west on the island Spitsbergen. Females with cubs-of-the-year or their tracks indicated some denning in southern, eastern, and northern parts of Spitsbergen. Telemetry also revealed that females captured in Svalbard and the Barents Sea den in Franz Josef Land, Russia. The majority of dens (62%) in Svalbard were located on land within ca. 1 km of the shore with the most inland den 19 km from shore. Heavy exploitation of polar bears before 1973, when a hunting moratorium was implemented, likely led to reduced denning in some areas. Our observations of den distribution indicate that denning is now more widespread in the archipelago than 50 years ago and reflects a reestablishment of denning areas following years of protection. The Norwegian Polar Institute (NPI) provided funding for the study. We would like to thank Anders Skoglund at the Mapping Section, Norwegian Polar Institute, for help with maps and GIS analyses. We also thank the World Wildlife Fund for supporting the research programme.